This edition is a set of three volumes, each sold separately. 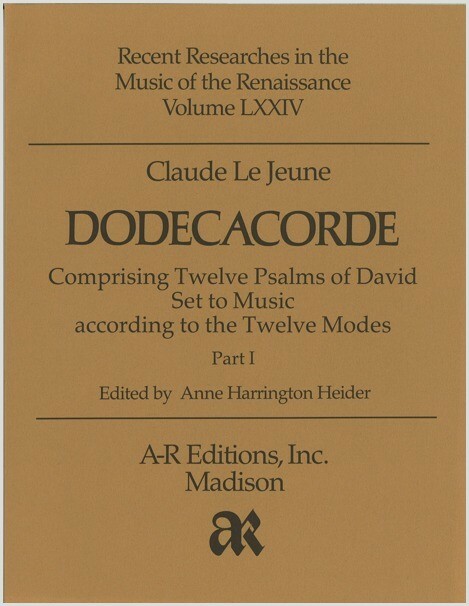 The Dodecacorde (1598) represents the culmination of Le Jeune's career in a masterly integration of polyphonic style and musique mesureé. Newly edited from the original partbooks and provided with complete prose translations of the French texts, the present publication makes accessible to both scholars and performers a remarkable repertory of sacred polyphony previously unavailable in modern score. This edition presents Le Jeune's twelve psalm settings (on Psalms 138, 35, 45, 23, 102, 51, 124, 60, 46, 76, 72, and 110, one in each mode) that use texts and melodies from the Genevan Psalter as canti firmi.